I get a lot compliments on my fingernails – most people don’t believe my nails are natural and that I do them myself. And I’m willing to share my secret – NailTek. I apply NailTek Foundation II once a week and apply NailTek Intensive Therapy II almost daily. Daily is recommended, but I tend to slack off and go every other day. Then repeat the regimen weekly. 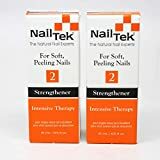 I used to bite my nails, but not since I started using NailTek about 5 years ago. So, I immediately went to Ebay.com and bid on a bunch of the old style bottles of NailTek to stock me up for awhile. Maybe by the time I run out of these dozen bottles I won, Prima Technologies will realize their mistake. 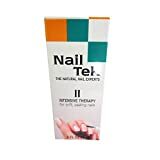 *Update – turns out they didn’t switch on me – the salon lady sold me Nail Tek’s Hydration Therapy saying it was the same thing…. it’s not (and I don’t recommend it).